New Mexico Gov. Susana Martinez says she was pleased that state lawmakers came together for a special session and passed measures on capital funding and tax incentives. But the Republican stopped short Monday of saying she wouldn't veto specific line items for projects. Martinez says she will take her time to examine the details of a capital spending bill for roads and water projects. She praised the GOP-led House and the Democratic-controlled Senate for putting aside differences for the state. Both bodies passed three key measures during a four-hour long special session Monday after months of partisan bickering. The New Mexico Senate has passed a bill to fund $295 million worth of public works projects. 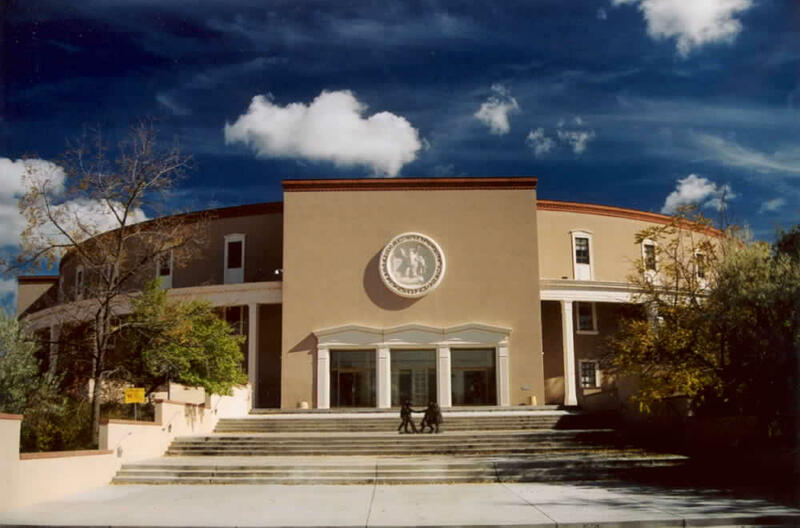 The Democratic-controlled chamber voted 42-0 during a special session Monday in Santa Fe to send the proposal to the GOP-led House, which is expected to pass the measure without amendments. Senate Majority Leader Michael Sanchez says senators will wait patiently for the House to deliberate the measure, which will fund senior centers, higher education and other public projects around the state. Some senators say the measure marks a compromise with the governor's office and a win-win for New Mexicans. The legislature has passed a measure to fund state courts and the state Department of Health, a bundle of tax incentives, and they set aside $112,000 to fund the special session. They hope to finish by Monday evening. New Mexico lawmakers are heading back to Santa Fe in an effort to resolve partisan bickering over a $295 million capital projects package. The GOP-controlled House and the Democratic-led Senate are scheduled to begin a special session at noon Monday following an agreement over capital spending. Despite calls from business leaders to pass a capital spending bill for roads and water projects, the quibbling chambers failed to reach a compromise before the regular legislative session ended in March. An election winner who was convicted of a felony in 1997 needs a pardon from Gov. Susana Martinez by noon Monday or he can't take his seat on the Middle Rio Grande Conservancy District board. Matthew Aragon is waiting to see if he can serve on the board after he beat an incumbent and two other candidates last week. He was convicted in 1997 of shooting at an occupied vehicle or dwelling. Aragon says he served six months of work release and the rest of his nine-year sentence was suspended. A district court judge ruled that convicted felons can't hold office, but can run for election if they meet all other candidate requirements. Martinez officials say all pardon requests need to go through a long process. The family of a man shot and killed by Albuquerque police after he brandished a pair of knives is suing the city. Attorney Frances Crockett Carpenter, who is representing the estate of Vincent Wood, filed a wrongful death suit last month. Two officers shot the 66-year-old Vietnam Veteran in July 2013 in a gas station parking lot. Carpenter says police reports show the department had previously interacted with Wood several times and knew he was mentally ill. In the suit, she says officers should have waited for a crisis intervention officer or tried non-lethal methods to subdue him. An autopsy report found Wood was shot nine times. The suit is asking for damages in excess of $25,000. Police declined to comment, citing a policy not to discuss pending litigation. New Mexico transportation officials say they don't have the funding to meet a deadline to install a federally mandated safety upgrade to the state's Rail Runner line. The Albuquerque Journal reports that the state Department of Transportation says there is no plan to cover the $50 million cost for safety technology designed to prevent collisions and derailments. The Federal Railroad Administration is threatening to fine railroad owners who don't implement the technology before the Dec. 31, 2015 deadline. The "positive train control" technology automatically slows trains that reach dangerous speeds through human error. It uses GPS and other devices to tell when trains are going too fast or making unauthorized movements. Congress first issued the deadline in 2008. State transportation officials say they need an extension. The New Mexico Game and Fish Department is considering easing up on limits to hunting and trapping certain animals, a plan that is riling conservationists. The Santa Fe New Mexican reports that the State Game Commission will hold its last public meeting on the department's proposal Saturday in Taos. The Game and Fish revisions would permit more black bear hunting, cougar trapping and snaring on private land. The agency says new data on population densities warrants an update of the limits. The State Game Commission will hold final votes on the proposal in August. Commission spokesman Dan Williams says the panel is waiting for a study to be completed. Conservation advocates say they are worried allowing more hunting will have negative long-term effects on animal populations. A man charged with attacking a bus driver was found in contempt of court when he used offensive language to refer to an Albuquerque judge. KRQE-TV reports that Thomas Crum told Judge Daniel Ramczyk Saturday that he wanted to be let free without a bond, but the judge denied the request. Ramczyk set a bond for the man and ordered him not to ride on any city buses. As Crum was being led away, he told officers that he wasn't afraid of them or "that (expletive) judge." An angry Ramczyk said he was holding Crum in direct contempt of court for his disrespect and foul language. Crum asked the judge, "Do you know who I am?" He was given a $10,000 cash or surety bond. A Las Cruces physician is facing additional federal charges for allegedly over-prescribing pain medication, which resulted in the deaths of four patients. The U.S. Attorney's Office for New Mexico says 62-year-old Pawan Kumar Jain pleaded not guilty Friday a 114-count indictment. The indictment includes two new counts of the unlawful dispensing of controlled substances resulting in death and a new count of health care fraud resulting in death. A federal grand jury indicted Jain in April 2014 on dozens of counts for similar offenses but related to the deaths of two people. Jain allegedly committed the offenses between April 2009 and June 2010 while operating a Las Cruces pain management medical practice. His medical license was suspended in June 2012 and revoked six months later. Candidates seeking office in a Navajo election won't be able to proceed if they have an outstanding ethics violation. President Russell Begaye on Friday signed into law a resolution that prevents candidates with any outstanding ethics judgments, including orders of restitution, from running. The measure won unanimous approval from the Navajo Nation Council last month. According to the law, elected officials who are in violation can face disqualification from an election. Current tribal officials could be removed. Begaye says the measure shows the Navajo Nation that government officials will be held accountable. The Daily Times in Farmington reports the tribe's Ethics and Rules office recently found more than $600,000 in unclaimed restitution from cases between 1997 and 2003. The board of directors overseeing one of New Mexico's major irrigation districts has been forced to fill a seat after the governor declined to issue a pardon for an election winner who was a convicted felon. Matthew Aragon was facing a noon deadline Monday for getting a pardon, but the governor's office says all pardon requests need to go through a long process and that Martinez didn't appreciate being asked to provide special consideration for a political purpose. Without the pardon, Aragon couldn't take his seat on the Middle Rio Grande Conservancy District's board. Other board members voted Monday to appoint runner-up Beverly Dominguez Romero. A client at the Gallup Detox Center lost his chance at escaping the building when he stepped on a water pipe and caused a leak that shut down the facility. The Gallup Independent reports Facilities Manager Ansley Curley says the incident occurred Friday morning. Gov. Susana Martinez is pledging $1 million to improve part of the track used by Southwest Chief in New Mexico. Public Service Co. of New Mexico says power has been restored to parts of Santa Fe where an outage knocked out service to 11,000 customers. Power was out for part of Monday morning on the city's north side, including the downtown area. The utility says repair crews found that a large bird got into equipment, causing the outage. The Arizona Game and Fish Department is suing the federal government to force it to develop an updated recovery plan for endangered Mexican grey wolves. The lawsuit filed Monday is aimed at forcing the U.S. Fish and Wildlife Service to publish a plan that includes guidelines for when the wolves can be removed from the endangered species list. Without those criteria the agency says the wolf could never be delisted. The state is already involved in litigation in an effort to block plans to allow Mexican wolves to populate larges areas of Arizona that the agency says are not part of its historic range. A survey released in February showed 109 wolves in Arizona and new Mexico, more than at any time since a re-introduction program began in 1998. New Mexico's attorney general is investigating the circumstances that led to the release of a repeat offender who prosecutors say went on to kill a police officer. Attorney General Hector Balderas this week is summoning about a dozen criminal justice and social service providers who came in contact with 28-year-old Andrew Romero. Prosecutors have charged Romero with first-degree murder in the Memorial Day shooting that killed Rio Rancho police officer Gregg "Nigel" Benner. Romero has yet to enter a plea. His public defender, Stephen Taylor, says grand jury proceedings are scheduled for later this week. Balderas says the judicial system failed by not keeping Romero behind bars. Romero is a convicted felon who was put on probation when he could have received up to 13 years in jail for possessing illegal drugs, a stolen car and a weapon.